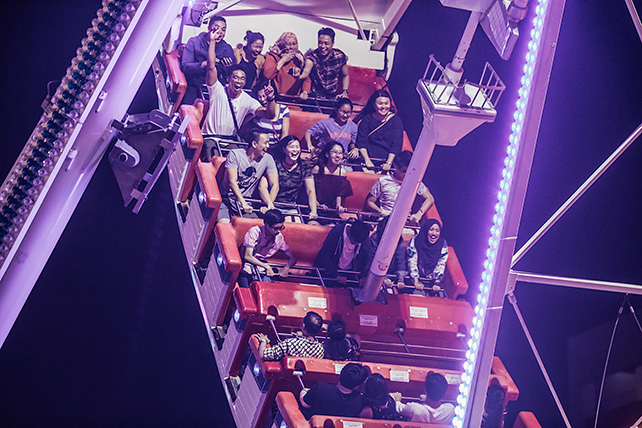 The largest scale of its kind in Singapore, the Prudential Marina Bay Carnival is back! Featuring 50 rides and games from Europe and around the globe, the Carnival will also progressively roll out three monthly themes – inviting all visitors to make ‘Crazy’, ‘Loving’ and ‘Epic’ memories with their friends, family and loved ones. Situated at the Bayfront Event Space this edition, the Carnival will transform over 23,000 square metres, or 4 football fields, of the city’s business centre into a massive vibrant playground. Co-producers – Pico Pro and The Great European Carnival – will also be introducing new rides and games, an array of festive programmes, innovative promotions, and new elements such as food challenges and a dance competition, to keep visitors engaged. While entry into the Prudential Marina Bay Carnival remains free, prices for rides and games will also be made more accessible for all visitors. Fast track passes are also available for purchase for visitors who wish to skip the queues at selected rides.